Kiloray won 1st in the North Dakota PDC 17 entry Open Derby stake in August. Thanks to Todd Manns for purchasing Jack and giving him an opportunity in field trials. I have every confidence that Jack should be a multiple champion in the future for Todd. “Lefty” is knocking on the door every time down as an All Age competitor. Judges Will Dunn from Kentucky and Bill Mason from Alabama named Greypointe Izquierda as the winner of the inaugural Heartland Open All Age National Qualifier stake held at Gentry, MO in March 2014. Lefty ran a huge race over the rolling crop fields and wooded edges scoring four times on bobwhites during his exciting hour. 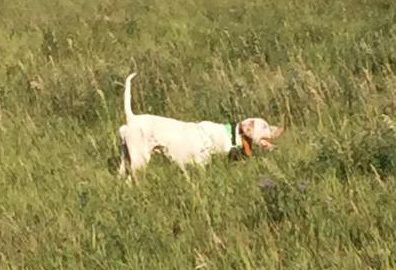 The win earned "Lefty" his first leg to compete in the National Bird Dog Championship at Grand Junction. He will be entered in a limited number of qualifying stakes during the next trial season in an attempt to complete his qualification which requires one more first place win in a designated stake. Thanks to the Pony Express FTC and Smith Farms owners Larry and Linda Smith for providing their venue and their vision and hard work to bring another National Qualifier to the Midwest. I also wish to thank Eddie Berendzen for the superb job he did in scouting Lefty to this win! Without a good scout, an all age dog is often lost as they range ahead with extreme speed in their search for game. Eddie and the others who have successfully scouted this dog are as much or more a part of his wins as his handler. He won the December 2013 Midwest All Age Classic at Gentry, MO with a three find performance and huge race. The trial is an All Age invitational as well as Purina points trial. Eddie Berendzen did an outstanding job of scouting, and we thank him greatly. Lefty was notably called back in 2012, at Mortlach, Saskatchewan in the National Amateur Chicken Championship for a “sudden death run-off” for the title after a scorching hour in the initial stake. Unfortunately, he did not annex this title at 26 months of age but it was a real statement to his ability to course thru the Canadian prairies without being handled or directed to every objective. Lefty had pointed birds in the AFTCA Region 14 AA Championship which preceded the National Amateur but a noisy covey of Huns caused a little too much mark of flight for the judge’s consideration. Both hours at Mortlach were in sunny 70 degree temps on back to back days, and the call back was conducted at over 80 degrees. Lefty still smoked the country looking for more ground. “Poncho” is by S F McKenzie, winner of the Pelican Open All Age National Championship qualifier, among other quality wins and shooting dog winner Greypointe Gloriosa. Poncho has been a consistent Derby winner in Midwest All Age stakes this past season including Onaga, KS and also grabbed an All Age win at Falls City, NE. He is a biddable All Age dog who stays to the front and independently searches the far reaches of the course for game. He is a full brother to All Age competitor Greypointe Izquierda, Derby sensation S F Strongwind and Greypointe Invierna, herself a Derby winner. Poncho is expected to compete strongly this season in All Age championships after another summer on the North Dakota Prairie. A 57 pound powerhouse, he hits his birds hard and is solid broke. Look for him to add to his win total this season.